Apollo Sprayers International, Inc. is a proud co-sponsor of the annual Excellence in Woodworking exhibition which is held by the Arizona Association of Fine Woodworkers (AAFW). Apollo donates a $200 gift certificate for the “Excellence in Finishing” category. 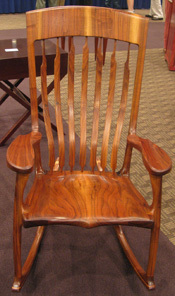 Arizona Association of Fine Woodworkers (AAFW) is a nonprofit organization of men and women interested in woodworking. All levels of woodworking experience, from beginners to skilled, are welcome to join us and participate in club activities. From amateurs to professionals, from novices and beginners to skilled craftsmen and craftswomen, our membership covers a wide range of skills and knowledge. This is our 5th year being involved with the association and we are pleased to be able to support their fine efforts. Each year this show gets bigger and better. The show has now been running 6 years, 5 of which Apollo has been a part. 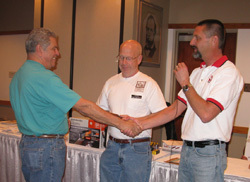 As co-sponsor of the event Apollo donates equipment prizes for “Excellence in Finishing”. This year was no exception. Congratulations to Terry Schroyer for her best finish award for her bear intarsia which won first place best of show for finishing. Terry won a 7500T Atomizer spray gun, a $459 value. 1st Place – Rick Ford for his beautiful mission style display case. Great Job Rick! 1st Place – Chris Muse for his beautiful guitar. Great job Chris! 2nd Place – Mike Berkshire for his awesome Table, excellent effort Mike! 3rd Place – Gary Hohner for his exquisite Maple Desk, wow!